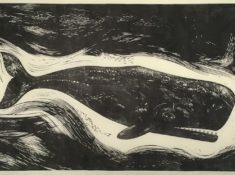 I’ll be printing my giant Whale linocut at the London Illustration Fair on 1/2/3 December. This linocut is the biggest I’ve ever carved and was made originally for a steamroller printing event organised by Ditchling Museum of Art+Design. These days I don’t have access to a steamroller so I have to print it using a wooden spoon (it’s too big for my press). 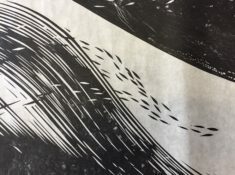 How long does it take to print a linocut measuring 6ft x 3ft with a spoon? About four hours. At the fair I will also be selling my linocut prints and cards and signed copies of my book, Linocut for Artists and Designers. You can find me in Room 7 on the second floor. Below are a few photos of the print, taken at Hello Print Studio in Margate. I am using Caligo Safe Wash relief printing ink on Japanese kozuke paper. The ink is slow drying, so that I can ink up the whole block and it is still wet enough to print four hours later. I chose the paper partly because it’s the right size (it comes on a metre wide roll) and partly because it takes the ink nicely. Once printed the whole thing has a kind of skin-like quality and almost seems alive. After I’ve inked the block I unroll the paper over the top, a section at a time, using weights to stop it moving. I then burnish the back of the paper with a wooden spoon. As I burnish I can see the ink being absorbed by the paper and I can check progress by carefully lifting it up to see if I have missed any bits. 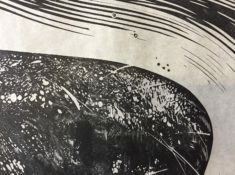 Unlike printing linocuts on a press, which results in a very even layer of ink, the spoon gives a lot of textures, reminiscent of a charcoal drawing. 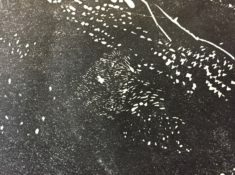 Each print shows the movement of the hand burnishing and each is different and unique. 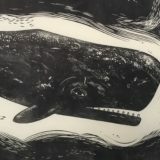 My Whale linocut will be available to buy from the London Illustration Fair and is also available online from my BigCartel shop. It is an edition of ten, price £500.